Ripped Freak Review - Does PharmaFreak's Hybrid Fat Burner Work? Do you want a ripped shredded physique? Do you easily want to melt away that excess body fat and show off those muscles you have been working so hard to build in the gym? Well Ripped Freak from the labs of PharmaFreak, could be the answer. 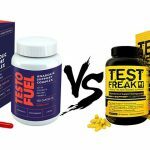 You maybe interested to know that PharmaFreak produce a number of gym supplements including the testosterone booster Anabolic Freak which we have also reviewed in-depth. 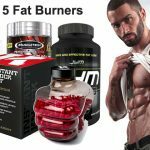 But first let’s look at the science behind this ‘hybrid fat burner’ Ripped Freak, let’s see if the formula has any supporting evidence to back up these claims, will it really help you shed fat effectively? 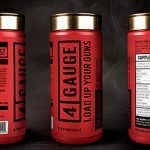 We were excited to see lots of very effective fat burning ingredients in this product such as caffeine, red pepper extract, green coffee bean and green tea. Unfortunately these nutrients are hidden behind PharmaFreak’s own proprietary blend so we can’t see what the exact dosages are. This means we don’t know how effective the formula is for overall fat burning. Proprietary blends are not good news, what are they trying to hide from you? 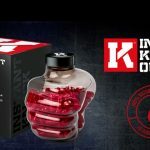 The second proprietary blend is very disappointing, it contains raspberry ketones which are completely ineffective for weight loss having no solid clinical backing. Its only saving grace is that this component only makes up a small part of the product. 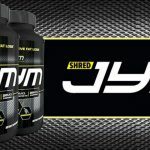 Overall we would expect to see some thermogenic fat loss with this formula, although without knowing the exact quantities it is hard to determine how much. You should expect to see some energy increases whilst using this formula due to the caffeine content. One noteworthy problem is the lack of any appetite suppressant, including one would have made it a more rounded and effective weight loss supplement. So while this has some great ingredients, it is not without its problems. This could have been a much better formula if they had left out the useless raspberry ketone blend. This is a great choice to include in a fat burning supplement, it is arguably the best natural stimulant available on the market. Countless studies have shown that it’s highly effective for boosting both energy levels and metabolism. Not only that but it has been shown to promote mental focus and even increase power output. It will certainly help you push harder in the gym, meaning you burn more calories and burn more fat. Also whilst on a low calorie diet stamina levels are likely to drop; this will help you maintain your energy and keep you going with whatever you need to get done. This herb is another excellent choice. Green tea is one of the best natural thermogenics available. There have been numerous clinical studies to show that green tea is great for promoting fat loss. The reason is because it is rich in antioxidants and specifically something called catechins. Once these catechins have been absorbed into your body, they help release the fat burning hormone known as norepinephrine. The more norepinephrine you have in your system the greater your potential for fat loss. Green tea also contains mild trace amounts of caffeine and L-Theanine which should help you with energy and focus. This is more of a supporting ingredient in Ripped Freak. Although Pharma Freak claim the stimulant Oleuropein Aglycone (OA) extracted from this nutrient does promote norepinephrine and epinephrine. Norepinephrine and epinephrine are known to promote fat loss and energy/metabolism respectively. However they base all their facts on one single study alone which is suggestive rather than conclusive. There is no widespread concrete evidence that OA does promotes these hormones. Either way even if its fat burning properties are bogus it has been shown to mildly influence blood glucose levels. By keeping your insulin levels low you can minimize the amount of fat you gain. Another excellent choice for a fat burner and a great thermogenic. There have been several studies to show that a component in the bean called chlorogenic acid is highly effective for fat loss. Once absorbed into your body the chlorogenic acid will help to cut down the amount of glucose in your liver. Glucose is what your body uses for energy. When you have less of it in your system, your body will need to look elsewhere for an energy store. The good news is it will use your stored fat cells as energy next. This means you can cut down your overall fat levels with no extra effort required from you. Great for helping you burn more calories and unwanted fat – this ingredient should be in the very best fat burners. This contains capsicum which is a potent and reliable thermogenic fat burner. We also finally get to see a dosage value of one of the nutrients. Essentially capsicum is what gives chili peppers their heat. Once absorbed by your body the capsicum will help to raise your body’s core temperature. This kick-starts your body’s cooldown process to handle the new heat level. By switching on your body’s natural ability to regulate core temperature you burn more calories and stored fat than you would normally. This is a brilliant way to burn more calories and fat without any extra effort on your part. There has also been links to show that capsicum has mild appetite suppressant properties. We come to the first bad ingredient in Ripped Freak. A chemical that naturally occurs in various fruits. This fad nutrient was once believed to help promote fat loss and dieting. In fact it is still very heavily marketed as doing so. Unfortunately it lacks solid scientific backing. Currently it has never been seen to work in any human study and is unlikely to do so based on research that is out there. Raspberry ketones have only ever had a small effect in clinical studies using rats and only then when they were give huge quantities of this nutrient. With such unpromising results the quantities will never be scaled up to a human study. Interestingly this ingredient is currently banned in the European Union. Tagged as a ‘novel food’ they don’t want it used in supplement products due to the lack of research. Potentially there could be issues and side-effects in the future which are unknown because of no testing on humans. This is a very bad choice. Not a good option – similar to raspberry ketones it lacks human testing. Believed to promote weight loss the only evidence of it being effective has been with studies on rats. This again is with very large amounts which doesn’t scale up well to tests on humans. Take one to two capsules with 8 ounces (250ml) of water on an empty stomach daily. The first capsule should be taken before breakfast, while the second optional capsule can be taken early afternoon with a meal. You can also use it as a pre-workout as they recommend consuming 30-60 minutes before your workout on gym days. The best fat burners require you take a serving 3 to 4 times a day. This puts you in a consistent fat burning mode throughout the day and avoids the energy crashes. So 1-2 per day is not ideal and not the most effective dosage schedule to maximize your fat burning potential. As far as we know there are no major issues with Ripped Freak. However because this product contains caffeine and the exact dosage is unknown those with a low tolerance to caffeine should be careful given the potential side-effects of caffeine (headaches, jitters, insomnia etc.). This is probably more relevant if you are taking 2 servings a day. The formula contains some of the top fat burning ingredients available on the market. Green tea, caffeine, capsicum and green coffee bean are the best nutrients to look for when choosing an effective supplement to melt away body fat. A process that makes the body burn more calories than usual even at rest. The nutrients green tea, red pepper and green coffee bean have been clinically proven to do just that. Essential if you are on a low calorie diet and need to maintain energy levels. It should even promote greater calorie burning through exercise and increase your metabolism. The inclusion of the natural stimulant caffeine is the key here. Pharma Freak has been around since 2008 and has built up a loyal fan base. 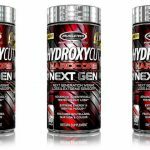 Becoming one of the more popular sports supplement companies in the industry is surely testament to the quality of their products and customer service. 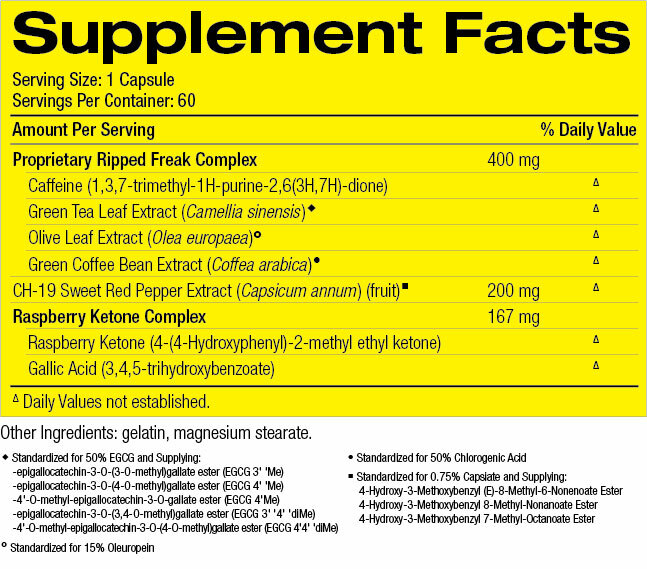 Contains two proprietary blends, you cannot see exactly how much of each ingredient you are putting into your body. Without the exact dosages it is impossible to know exactly how effective the formula is overall for weight loss and fat burning. There is no excuse these days for not having a transparency on the nutrient label. The recommended dosage is 1 to 2 servings a day. With this schedule there will be a large drop in nutrients between servings meaning you drop out of thermogenic fat burning mode. The best fat burners use 3 to 4 servings a day to avoid this issue and maximize your fat loss. The raspberry ketone blend is completely useless and should not have been included without scientific proof that it actually works. Neither the raspberry ketones nor the gallic acid are going to benefit you any way. To make this a more rounded fat burner we would have expected some kind of appetite suppression. A fibrous ingredient like glucomannan helps keeps your hunger pangs under control whilst on calorie restrictive diet and just makes the whole process of cutting up easier. What are people saying about Ripped Freak? Checking the official the PharmaFreak website there are no customer testimonials. But looking at the big retail websites we can find plenty of feedback. Customers praised the fact that it gives them more energy; but for some all that energy gave them unwanted side-effects such as stomach ache and jitters. As we have mentioned users saw no appetite suppression, meaning they suffered major hunger pangs making dieting more uncomfortable. So what about the acid test of a fat burner? Well it’s mixed results concerning its effectiveness for fat loss. Whilst it seems to work well for some people it didn’t for others. Really this is the proving ground for this product, if it’s not getting you the results you want it’s best to look elsewhere. 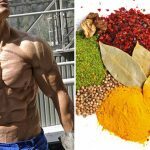 Ripped Freak had huge potential to be an awesome fat burner, it contains some of the best natural ingredients available for fat loss. But then it throws a spanner in the works with some really terrible ingredients like raspberry ketones. Even more unforgivable is the fact they hide all the dosages behind their own proprietary blends. In addition it lacks any appetite suppression and the customer feedback shows that actual results are mediocre at best when it comes to fat burning. Get rid of the raspberry ketones, bump up the other scientifically proven nutrients and add in a good appetite suppressant. That’s pretty much all it would have taken to make this a much more powerful fat burner. This is not the best fat burner we have seen. While it offers some users boosted energy levels it falls short when it comes to promoting effective fat loss. While it contains some of the top fat burning ingredients on the market, they are hidden behind a proprietary blend which is not good for you or your body fat percentage. With a lack of appetite suppression this is an average supplement, we advise you to look elsewhere if you want to get ripped. It’s same Ripped Freak food supplement with botanicals and hybrid fat burner?? They are the same product just different labels. 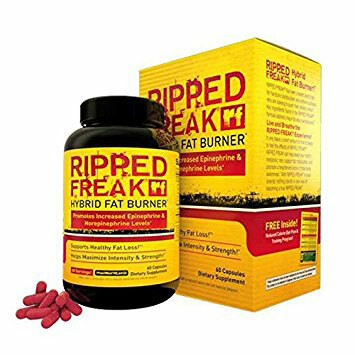 Hi guys I have used Ripped Freak it did nothing for did not lose weight all it did is make me sick. 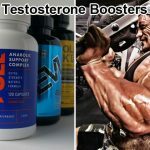 Is Ginseng an Effective Testosterone Booster?